What is That Lump of Hard Skin on the Top of My Toe? In general hard skin that forms on a toe is called a "corn." Corns can develop on the tops of the toes at one or both of the toe joints, at the tips of the toes, or in between the toes. They usually occur not on the big toe, but on one of the lesser toes. Corns can be very painful, especially if shoes press on the area - ouch! The skin becomes harder and more callused (and the corn more severe) the more pressure your shoe exerts and the longer you wear the tight-fitting shoe. Why Do I Have A Corn? Corns usually start because your toes are not perfectly straight. When the toes are bent or curved then the bone at the "knuckle" area of the toe becomes more prominent and susceptible to shoe pressure. Some people are born with toes that are somewhat "crooked," while others develop the condition over time. In either case the tendency to develop this problem is hereditary. If the toes bend or curl to the point that they no longer straighten this condition is called a hammertoe. In the case of a corn forming on top of a toe, the shoe is actually causing the corn by putting pressure on the bone of the toe. The skin is just an innocent bystander that gets "pinched" in between. The toe responds to this trauma of the "pinching" by causing the skin to get harder, thicker, callused. Initially the hard skin may act to protect the area from the shoe pressure. But, guess what? Your skin isn't very smart! It just keeps getting thicker and harder until it feels like there's a rock in your shoe. The most obvious thing to do about a corn on top of your toe is to stop wearing the tight-fitting shoes - but you aren't going to do that, are you ladies? Well, we strongly recommend that you at least cut back. You might also consider foregoing the discount shoes and investing in shoes with softer leather. It might also be time to consider a larger size or width for your shoes. Your feet, like everyone else's, could be getting bigger! If you must (sometimes!) wear the tight shoes then at least invest in some protective donut-shaped corn pads or the pricier but more durable and effective gel toe ringlets. but please never use the medicated corn removal pads - at best they won't work and at worst they will eat a hole through your skin. Another excellent option is to see a podiatrists. In most cases the dead skin of a corn can be painlessly shaved down and you will have immediate (but temporary!) relief. Please don't try this at home! The podiatrist should also be able to give you the long-term outlook for your problem as well as the treatment options available for your specific condition. In some cases the hammertoe becomes so rigid and the corn so severe that even wearing normal, properly-fitting shoes becomes painful. When this occurs only foot surgery (or walking barefoot or in sandals the rest of your life) can correct the problem. Surgery generally involves either relaxing or straightening the problem toe. 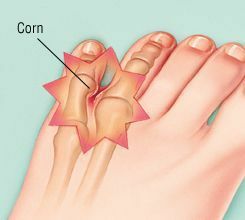 This has hopefully given you valuable information about corns - those painful bumps of hard skin on your toes - as well as motivation to keep them from getting worse by wearing proper shoes. This is one case where an ounce of prevention really is worth a pound of cure.